There are two ways to do Trenchless Sewer Repair and or replacement. One way is called "Pipe Bursting" and the other is "Pipe Lining". The video displayed to the left is the Pipe Bursting method. More information for Pipe Lining is located below. 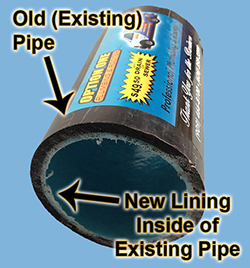 We now have the ability to re-line your old sewer line instead of replacing it. When you re-line your sewer, it eliminates all cracks, leaks, holes or roots that may be causing trouble to your system. Re-lining is essentially creating one, solid pipe with no joints. 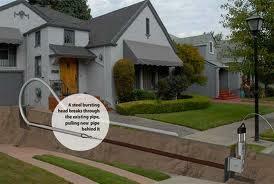 Most homes built pre 1970's have sewer and drain lines composed of either cast iron or clay. Traditionally, you will find cast iron in a home or building and clay sewer pipe outside the building to the city connection. The primary problem with cast iron pipe is cracking and the bottom of the pipe rusting or rotten out. Clay pipes primary problem is cracking from tree roots entering the pipe, then growing larger and cracking the clay. We get phone calls all the time asking if the city is responsible for a tree or if it's a city tree that is located near the street. Most cities put the responsibility on the residents for the maintenance of their sewer lines from the house to the city connection (which is located at the city main). The primary and extremely common problems seen in clay pipes are root intrusion at the joints and cracks (Tree or plant roots have penetrated the pipe for a water source). Root intrusion into sewer pipe systems is reported to cause 80% of all sewer blockages. Interference between trees and sewer systems is likely to occur in older systems and in cracked pipes. Factors that contribute to damage include older pipes with joints, shallow pipes, small-dimension pipes, and fast-growing tree species. Costs associated with caring for root intrusion in the past has been expensive and laborious. Unfortunately, running a drain snake is rarely a permanent fix. With the trench-less method, roots can no longer enter the line and that’s why we warranty the sewer for 50 years. What Is Trenchless Sewer Lining Valle Vista, Hemet, CA ? Trenchless drain lining replacement is a method of replacing an old pipe with a new pipe using the existing damaged sewer line as a passage and guide for the new pipe. Option One Plumbing does this by digging a small access hole where the pipe starts. Using your damaged sewer line as a guide, our inversion machine inserts’ a sleeve filled with a two-part epoxy resin that cures in just a few short hours. Now you no longer have to cut a trench through your yard, sidewalk, or driveway to replace sewer pipes. Trenchless technology creates a seamless pipe, which prevents infiltration, restores the structural integrity of the original pipe, and eliminates any pipe joints (which weaken and allow root intrusion). Trenchless Drain Replacement takes less time than older methods like traditional excavation and restoration. It's also approved by almost all local plumbing authorities and up to code specifications. As you can see, this is a before and after picture, we used the lining method of Trench-less sewer replacement. This was a cast iron line that we hydro jetted to remove all debris before we installed the new liner. Calcium deposits from water form a crusted coating called "calcification" which clogs up household pipes and drain lines, especially when hard water is in use. Once pipes are lined with epoxy, calcification can no longer occur because the deposits cannot adhere to the interior walls of the new epoxy barrier pipe. Seismic activity can cause breaks in sewer and drain lines, but more frequently, minor seismic activity causes cracking and structural damage at the joints. The seamless, "joint less" nature of the PIP (Pipe In Pipe) method means not only is the existing problem solved, but the new, seamless pipe will avert future problems as well. The epoxy resin used in lining your new sewer contains root and rodent killer as well. This will prevent future intrusion into your sewer lines or pipes, providing you decades worth of maintenance and service free use. No more rooting out your drain every every 6 months! We own our Trenchless Sewer Lining equipment. We also do trenchless sewer lining jobs for most of the plumbers in Valle Vista, Hemet, who then mark up the cost to you. When you call us directly, that saves you money! What Is Trenchless Pipe Bursting Valle Vista, Hemet, CA ? Trenchless pipe bursting sewer replacement is a method of replacing an old pipe with a new pipe using the existing damaged sewer line as a passage and guide for the new pipe. Option One Plumbing does this by digging a small access hole where the pipe starts and where the pipe ends. Using your damaged sewer line as a guide, we pull a heavy-duty cable and attach it to a hydraulic machine that pulls the new line through the old pipe, breaking or "bursting" the old line out of the way. Now you no longer have to cut a trench through your yard, sidewalk, or driveway to replace sewer pipes. Trenchless technology creates a seamless pipe, which prevents root infiltration, and leaves you with piece of mind. The Benefits of Trench-less Sewer and Drain vs Digging. We own our Trenchless pipe bursting equipment. We also do trenchless pipe bursting jobs for most of the plumbers in Valle Vista, Hemet, who then mark up the cost to you. When you call us directly, that saves you money!